I finally got to speak at GDC in the Indie Game Summit! 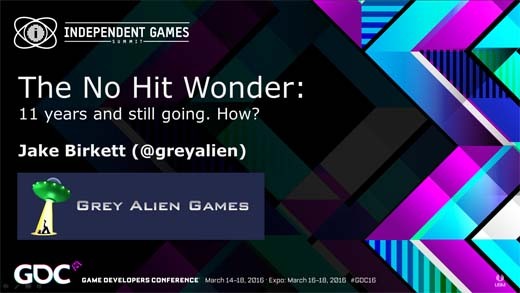 You can watch my presentation, called “The No Hit Wonder – 11 Years and Still Going. How?”, for free on the GDC vault! I felt that the speech went very well because it was packed full of tips and data and was quite funny. All week long people kept coming up to me to tell me how much they enjoyed it and how they’d even altered their plans as a result of my speech! GDC sent me the evaluation report and I was ranked #6 in the Indie Game Summit and #10 out of 132 summit talks, with 82% rating excellent, 17% rating good, and 1% rating terrible, LOL! In my talk I mentioned how an article by Steve Pavlina called “Cultivate Burning Desire” was a big factor in me going indie when I read it back in 2004, and so I was delighted when Steve posted a link to my speech on his website! Anyway, I hope that you enjoy it. Let me know what you thought in the comments, thanks! This entry was posted on Monday, April 25th, 2016 at 9:07 am and is filed under Business, Game Development, Positive Thinking, Speeches, Videos. You can follow any responses to this entry through the RSS 2.0 feed. Both comments and pings are currently closed.